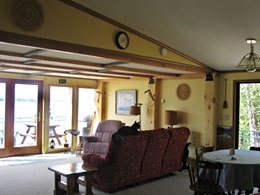 This spacious home features two living rooms overlooking beautiful Lake Champlain. The views up the lake to the Adirondack mountains and the Champlain bridge don't get any more picturesque than this. 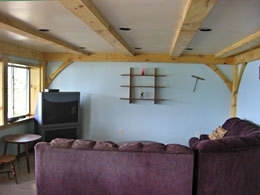 Four bedrooms (sleeps 10 people), three baths and kitchen. Linens are provided. 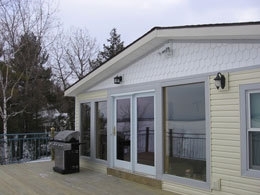 Fully equipped kitchen (including microwave), AC, wireless Internet, cable TVs in both living rooms, and a gas grill to enjoy a nice BBQ or your fresh fish from the day's catch on the large deck overlooking the lake. You can also enjoy a beautiful Vermont sunset in one of the two canoes or the fourteen foot row boat that are pulled ashore on the shale beach in front of the house. Great central VT location. 14 miles to Middlebury (home of the UVM Morgan horse farm, Otter Creek Brewing Co. and many other area attractions), Westport Yacht Club (15 min. by boat), Basin Harbor Club (15 min. ), Burlington (45 min., great shopping and dining, also the home of the Echo Lake Aquarium and Science Center - great for children and adults alike. Burlington offers many area attractions). 45 min to Middlebury College Snow Bowl - a family oriented ski area with 3 lifts and 17 trails ranging from the advanced skier to the little one just starting out. Fun for the whole family. Perfect place for your family vacation. Security / Damage deposit of $500 weekly. Plus 9% Vermont rooms tax and $100 cleaning fee. Nightly rates Sept 15 - May 15. 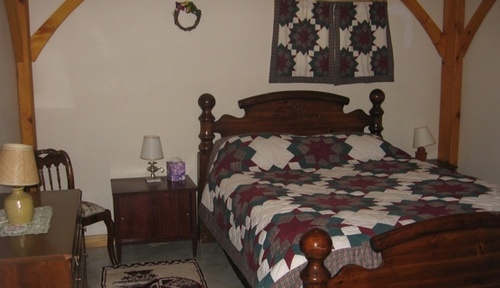 $225 per night (2 night minimum) 4th night free. Plus 9% rooms tax.